Stockholm. - The volume of US exports of major weapons rose by 23 per cent between 2005–2009 and 2010–14. 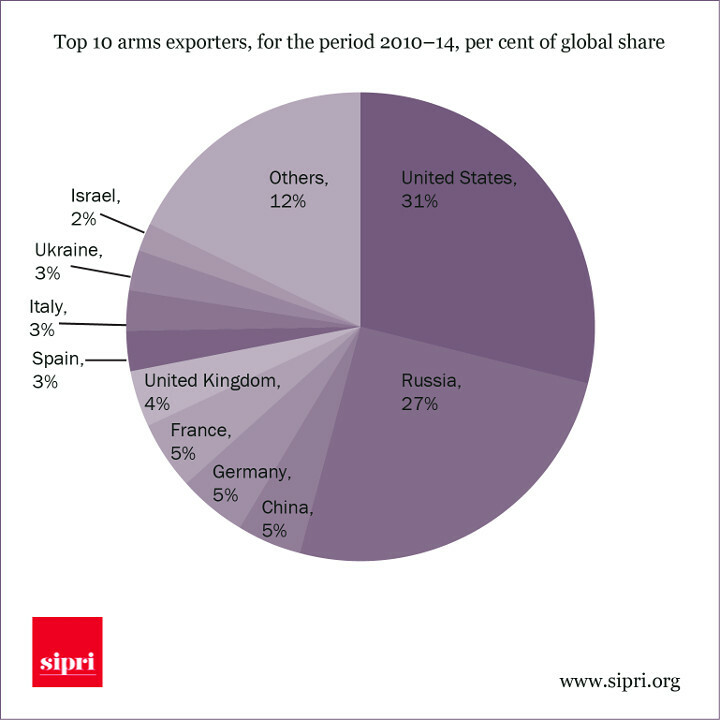 The USA’s share of the volume of international arms exports was 31 per cent in 2010–14, compared with 27 per cent for Russia. Russian exports of major weapons increased by 37 per cent between 2005–2009 and 2010–14. During the same period, Chinese exports of major arms increased by 143 per cent, making it the third largest supplier in 2010–14, however still significantly behind the USA and Russia. "The USA has long seen arms exports as a major foreign policy and security tool, but in recent years exports are increasingly needed to help the US arms industry maintain production levels at a time of decreasing US military expenditure", said Dr Aude Fleurant, Director of the Stockholm International Peace Research Institute SIPRI Arms and Military Expenditure Programme. Arms imports to Gulf Cooperation Council (GCC) states increased by 71 per cent from 2005–2009 to 2010–14, accounting for 54 per cent of imports to the Middle East in the latter period. Saudi Arabia rose to become the second largest importer of major weapons worldwide in 2010–14, increasing the volume of its arms imports four times compared to 2005–2009. "Mainly with arms from the USA and Europe, the GCC states have rapidly expanded and modernized their militaries", said Pieter Wezeman, Senior Researcher with the SIPRI Arms and Military Expenditure Programme. "The GCC states, along with Egypt, Iraq, Israel and Turkey in the wider Middle East, are scheduled to receive further large orders of major arms in the coming years." Of the top 10 largest importers of major weapons during the 5-year period 2010–14, 5 are in Asia: India (15 per cent of global arms imports), China (5 per cent), Pakistan (4 per cent), South Korea (3 per cent) and Singapore (3 per cent). These five countries accounted for 30 per cent of the total volume of arms imports worldwide. India accounted for 34 per cent of the volume of arms imports to Asia, more than three times as much as China. China’s arms imports actually decreased by 42 per cent between 2005–2009 and 2010–14. "Enabled by continued economic growth and driven by high threat perceptions, Asian countries continue to expand their military capabilities with an emphasis on maritime assets", said Siemon Wezeman, Senior Researcher with the SIPRI Arms and Military Expenditure Programme. "Asian countries generally still depend on imports of major weapons, which have strongly increased and will remain high in the near future." Germany is the fourth biggest exporters of arms. The volume of arms trade rose from 37 Billion Euro to 40 Billion Euro between 2005 and 2014.